TORNIELLO - Senatus Populus que Romanus Divotito Divi Vespasiani F Vespasiano Augusto. TORNIELLO, A - Senatus Populus que Romanus Divotito Divi Vespasiani F Vespasiano Augusto. Title : Senatus Populus que Romanus Divotito Divi Vespasiani F Vespasiano Augusto..
Map maker : TORNIELLO, A. Date : Holland, ca. 1625. Size : 13.4 x 12.8 inches. / 34.0 x 32.5 cm. 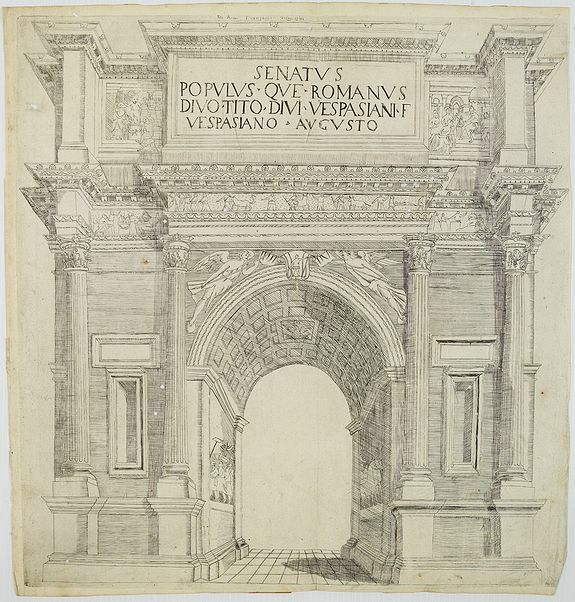 Description :A triumphal arch. The inscription above the arch says SENATUS POPULUSQUE ROMANUS DIVO TITI DIVI VESPASIANI F.(ilio) VESPASIANO AUGUSTO (the Senate and the people of Rome to the divine Titus Vespasian Augustus, son of the divine Vespasian). The use of the adjective divo means that the arch was erected after the death of Titus in 81 AD because the emperors were divinized only after their death. From an uncommon edition of Kerckelycke Historie van Neder-Landt which was a Dutch text edition of Agostino Torniello's Annales Sacri et Profani by Heribertus Rosweydus (1569, Utrecht - |?|? 1629, Antwerp). Condition : Paper slightly browned. Many small worm holes throughout engraved area. Else good condition.